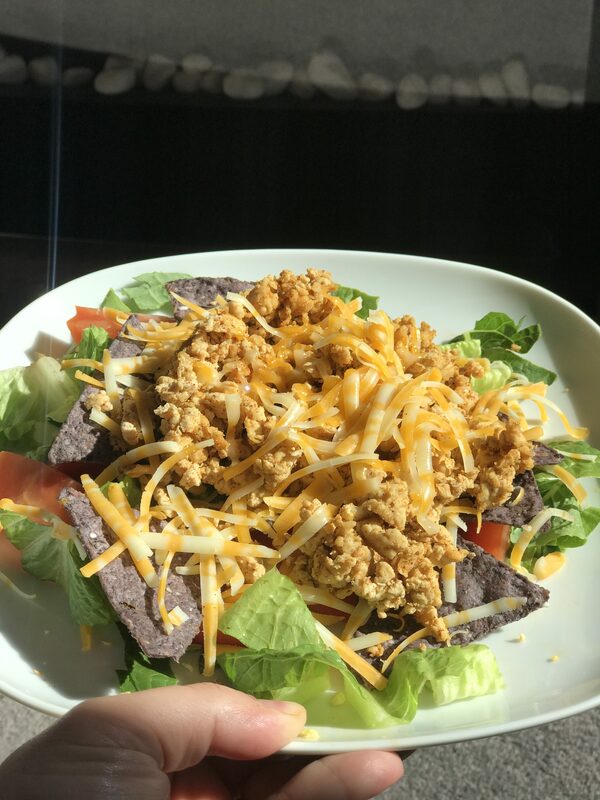 One of my favourite meals to make is Taco’s BUT all the carbs just aren’t on my meal plan right now, cause I’m not the type who has just one or TWO tacos… I’m a 5/6 kind of taco person SO, I traded in all my shells for a few organic taco chips and I feel just as satisfied. Part two of my growing “issue’s” with Taco’s… The seasoning… Between the sodium, and the sugar and the chemicals.. YES, I’m talking chemicals… DUDES, seriously go look at your taco seasoning (not including epicure)… I couldn’t believe all the extra crap in there! And I know you could make your own but I was always like, ain’t no one got time for that… Except I was wrong. It was SERIOUSLY SO easy and fast AND i’ll NEVER buy store bought again! A few things, I add a handful of tortilla chips to my salad to give it crunch and IF you desperately need sour cream swap it out for plain greek yogurt! But Basically Romain lettuce, tomatoes, Cheddar cheese and ground chicken are my go to’s. As our family doesn’t eat red meat and my kids are vegetarians, beef just isn’t something we buy. If you want to use the Veggie Crumble or ground round as a vegetarian options you can season the same way! After I’ve cooked up the ground chicken/turkey for myself I will also heat up some garden crumble for the kids stuff, and usually make them some soft tacos with whole wheat wraps. I would really like to make some paleo wraps next time… so stay tuned!